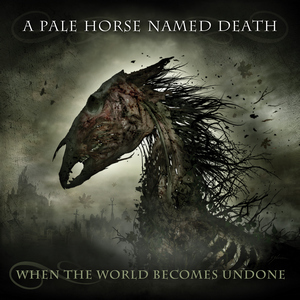 For the better part of the decade, original Type O Negative drummer Sal Abruscato has perpetuated his former band’s sound with A Pale Horse Named Death. With When The World Becomes Undone, fellow Type O Negative drummer Johnny Kelly furthers the legacy of the sound that defined the legendary Brooklyn gothic metal/doom act. Abrusco’s latest full-length offering will definitely keep the Type O fans happy. The guitar sound, slow pace, drum beats, gothic interludes and even horror skits (“The Woods” is similar Bloody Kisses “Fray Wray Come Out And Play”) bring to mind their former band, but listeners won’t mistaken the two. The arrangements are similar. Just listen to the way the album unfolds from the haunting intro “As It Begins” to the opening piano transitioned into a doomy drop (the Type O guitar sound) of the title track. However, there are notable stylistic changes. Sometimes the group takes a grungy route that recalls bands like Stone Temple Pilots and Alice in Chains in both music and vocals. The down tempo movements also revisit his former band, Life of Agony. Abruscato’s vocals are the glaring difference. Instead of the bass bellows and vampire roll of Pete Steel, his more voice is more akin to eerie sound of Layne Staley or the vibrato of Dax Riggs. Sometimes the music even relates a touch of Acid Bath. “The End of Days” is the perfect example as it encompasses all of these sounds. When The World Becomes Undone delivers what most listeners would expect from Life of Agony and Type O Negative alumni. That aspect should appease fans, but they should also enjoy the facets of their original sound. The gothic metal tag aptly describes the album, so elements such as keyboard-generated piano and bells lend the feel of a horror film. The album has an ebb and flow that keeps it from the doldrums. When The World Becomes Undone will never gain the legendary notoriety of River Runs Red or Bloody Kisses, but that doesn’t mean it won’t find a special place on the shelf or on your phone.